1. (By Mah Monavar Khanoum) Toghroltakin Mirza (died in infancy). 2. (By Malek Jahan Khanoum, Mahd-e Olia) Soltan Malek Mirza (died in infancy). 3. (By Malek Jahan Khanoum, Mahd-e Olia) Soltan Mahmoud Mirza (died in infancy). 4. (By Malek Jahan Khanoum, Mahd-e Olia) Nasser-ed-Din Mirza, later Nasser-ed-Din Shah (b. July 1831--d. May 1, 1896) (r. 1848--1896). 5. 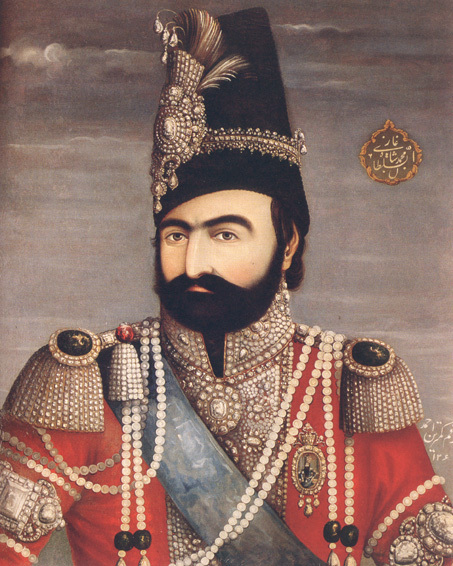 (By Rahimeh Khanoum, sister of Yahia Khan Chehrighi) Zendejan Mirza (died in infancy). 6. (By Khadijeh Khanoum, daughter of Emam Verdi Mirza, son of Fath Ali Shah) Abbas Mirza "Molk-Ara," (b. 1839 Tehran--d. 1897), ancestor of the Shams Molk Ara family. 9. (By Malek Khanoum) Ebrahim Mirza (died in infancy). 10. (By Ogholbeigeh Khanoum of the Salour Turkomans) Abdosamad Mirza, "Ezz-ed-Dowleh," (b. 1843--d.1929), ancestor of the Salour family. 11. (By Zeinab Khanoum of the Afshar of Urumieh) Mohammad Taqi Mirza, (b.1840--d.1901), "Rokn-ed-Dowleh," ancestor of the Rokni family. 2. (By Malek Jahan Khanoum, Mahd-e Olia) Princess Malekzadeh, "Ezzat ed-Dowleh." Born 1836. 6. (By Golrokh Khanoum Garmroudi) Princess Afsar-ed Dowleh (died in infancy). 9. (By Ogholbeigeh Khanoum) Princess Zahra, "Ehteram-ed Dowleh" (dates ?). Full sister of Abdosamad Mirza "Ezz-ed-Dowleh." -- Mohammad Shah had no issue with the following wives: Zobeideh Khanoum, Mehral Khanoum, Nezareh Khanoum, and Narges Khanoum. -- For more detail on the daughters of Mohammad Shah, particularly Princess Ezzat-ed-Dowleh, see Christopher Buyers, op.cit. -- Soltan Ahmad Mirza Azod-ed-Dowleh, Tarikh-e Azodi, Nashr-e Elm, Tehran, 1376 solar. -- Christopher Buyers, Qajar Genealogy. -- Kadjar Family Archives, Bahman Bayani, Tehran.